I actually wanted to post this in the morning, but since I’m so awake now, I might as well do it. If u follow me on twitter (IF you haven’t, follow now! @sweesan) u’d have seen my mini cooking adventure lol. Sometimes I stock up sausages in the freezer cause they’re always handy whether I’m making instant noodle or craving for some savoury snacks. 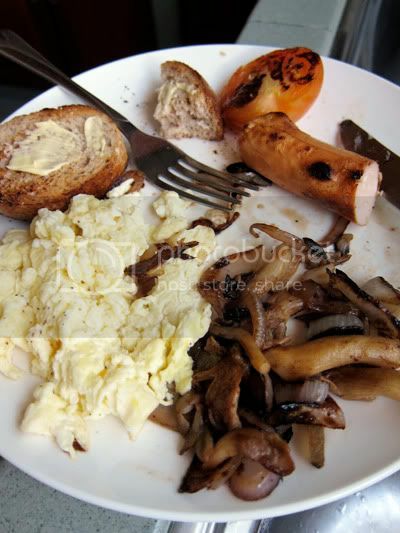 And one morning, I woke up and decided ok I wanna have the Cheese Sausage for breakfast. So I cracked 2 eggs, added some milk (wanted to add cream but there weren’t any in the fridge) salt and pepper. And scrambled it. Then, I remembered! Oh I bought a wholemeal baguette the day before, I might as well toast it on the pan. So I went and slice 2 pieces and just lightly toast it. Just when you thought ok, she should be done…. I suddenly recalled this “morning crepe” I always make when I was working in Sydney. It’s crepe with caramelized onion, mushroom, egg and maple syrup. So OKAY!! Maybe I will just cut some onion and caramelize it. *sizzle sizzle sizzle* – At that point, the eggs were scrambled, the baguette were toasted and the sausage is still cooking on the same pan as the onion. I ran to the fridge, grabbed some oyster mushrooms, washed them and chuck them together with the onions. Whilst checking out the fridge, I saw this cute tomato and I thought, okay some vege wouldn’t hurt. So I sliced the tomato in half and put it in the pan with the rest of stuffs. Then, I saw this white wine (leftover from the carbonara) and decided to add some into my caramelized onion and mushroom. I think I had too much. But it was FREAKING GOOOOOOOOOD I tell ya. Most satisfactory breakfast ever at home, and don’t need to pay a ridiculous price for it. 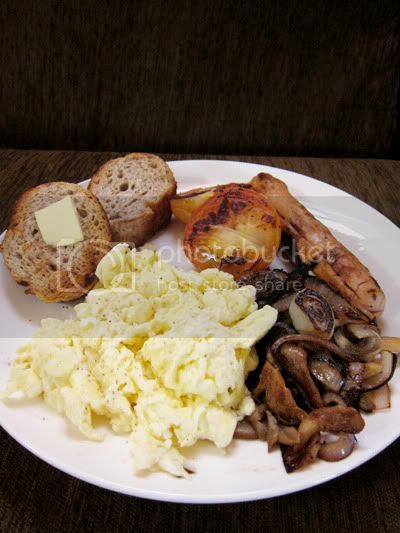 Swee San, you pay AUD17 for that plate of big breakfast in Australia and the difference is, they use truffle oil instead of normal oil. And a quick google you realise truffle oil doesn't even contain real truffle in it, AUD17 for a plate of chemistry bonded oil in everything? Give me EVOO anytime! Tracie : Yah and it only cost like a fingernail instead of an arm..
Jia : Really ?? I like Bill's and this place in Bondi, can't remember though but they had this fritter with smoked salmon and spinach .. awesomelicious! Cumi & Ciki: veery filling too! !